If the Grande Prairie Hockey Legends Committee needed confirmation that they made the right choice in selecting Darren McAusland as a GP Hockey Legend, Barry Trotz, now coach of the Nashville Predators, provided it. Darren McAusland was and is, quite simply, the ultimate team player. He was a winner on the ice and he is a winner off the ice because of his character, integrity and professionalism. We won a Calder Cup together in Portland in part because Darren was an integral part of that team. He brought a smile and professional attitude to the rink every day and his team-first approach rubbed off on his teammates. Guys wanted to be around Darren because of his personality and approach to the game. Perhaps under appreciated in some circles, Darren was very much appreciated by his coaches and teammates. Players like Darren make teams successful. The Grande Prairie Legends of Hockey Committee could not have selected a better person to recognize than Darren McAusland. I’m proud to have had the pleasure of coaching him and proud to call him a friend. 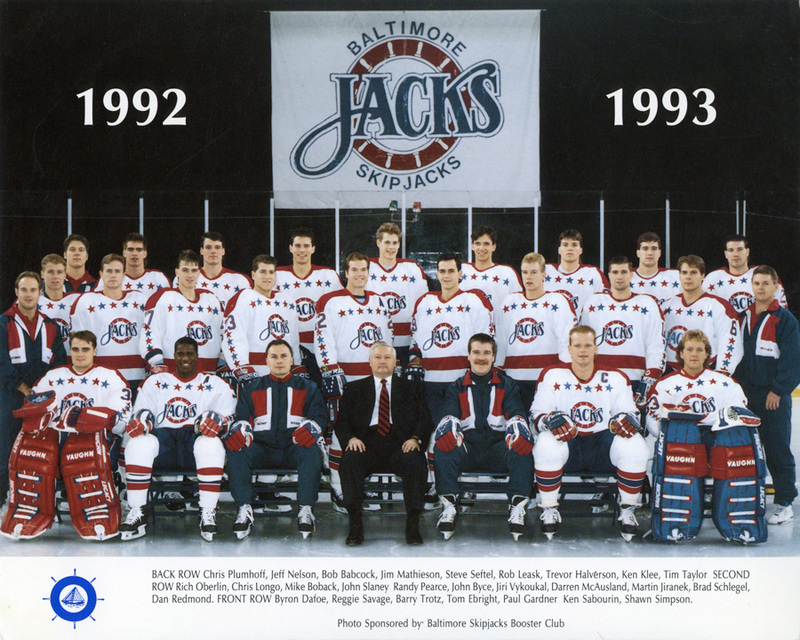 Darren played five years with Barry as his coach: one year with the Baltimore Skipjacks and four more following the team’s relocation to Portland, Maine. The respect between player and coach was reciprocal. “Barry and Paul Gardner, assistant coach, are still two of my great friends today. Barry Trotz is a hockey technician. I never played for anyone who had his team better prepared for an opponent,” says McAusland. In keeping with Darren’s loyal and generous nature, he is quick to attribute his success as a hockey player to his rink rat family and his roots in Grovedale, a hamlet near Grande Prairie in Northern Alberta. 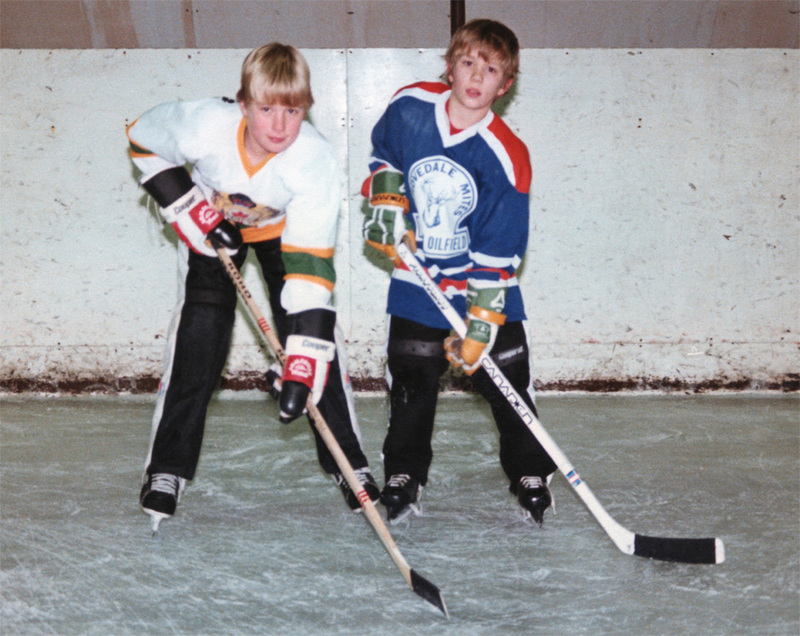 Linked to family support was unlimited access to ice time – both are considered to be major factors in the superior skating and hockey skills that Darren acquired. 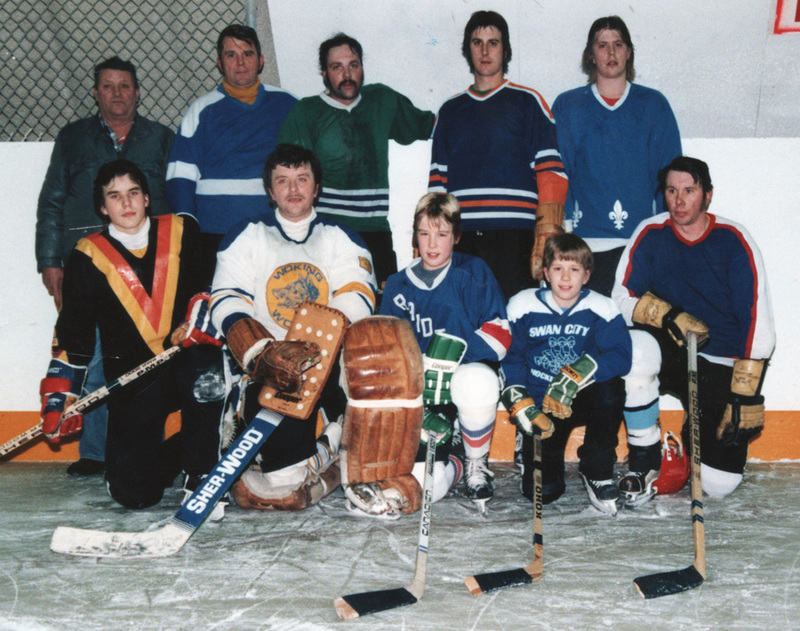 The history of rinks in Grovedale is a story within Darren’s story of rural community spirit. Idyllic is the only way to describe his journey from a two-year-old tot from tiny town Canada to a Paul Coffee-like pro that travelled widely and played in the most famous arenas in the world including the Maple Leaf Gardens. 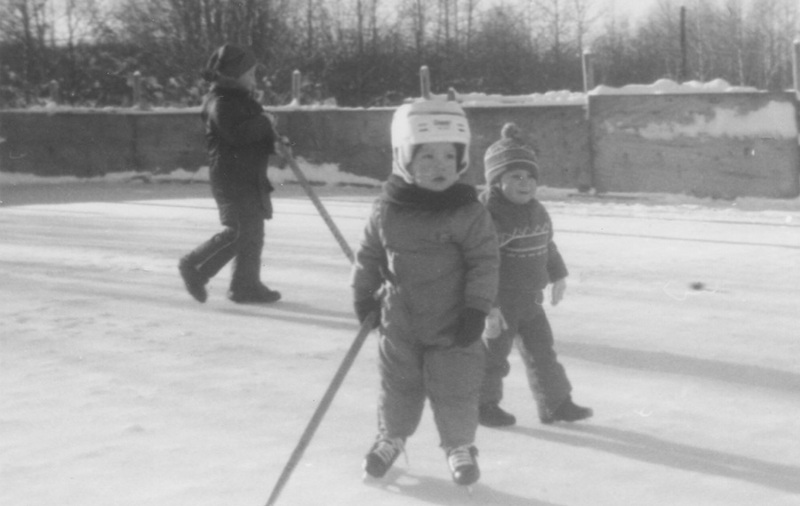 It all started before Darren’s time with his grandfather trying to make a rink for Darren’s father, Darrel, and younger brother, Doug. “My dad tried to flood a rink across from the old school but all they had was a team of horses using buckets of water from the old school. Then a Chinook would come along and it would be the end of the ice. Finally, gave up,” recalls Darrel McAusland. Give up? Hardly – not for long – not the McAuslands. There was a slough nearby and later the road in front of the McAusland place was up-graded. In that process, a dugout was created where Doug McAusland learned to skate. Uncle Doug, ten years older than Darren, was his mentor and role model. Like his nephew after him, Doug had learned to skate as a preschooler on sloughs and a dugout that were cleared by his dad and his older siblings including Darren’s father. Darren and his friends admired and copied Doug’s moves. Doug, in turn, helped construct the rinks on which Darren and his friends learned to skate and play hockey. He took to the ice and played with them whenever he could. In the early 1980s, supported by government grants and volunteer labour, the community rallied to construct Grovedale’s first indoor arena that is still in use today. For the first nine years it was natural ice. Marj McAusland ran the rink during its first year of operation and at age nineteen Doug took over as Manager. Doug was proud of the ice surface he could make with his manual devices, first an old barrel on a sled and next another pull mechanism that was triangular in shape. Ice making was industrialized when Doug’s father donated a John Deer tractor to pull a mobile-type Zamboni as Doug described it. Today, scraping the ice and flooding it is accomplished by using an Olympia one-piece Zamboni. Since 1989 artificial ice has replaced the uncertain process of maintaining natural ice. The Grovedale arena is in operation twelve months of the year, used by local residents and organizations from Grande Prairie including Grande Prairie Minor Hockey. Rocky states that they have a good working relationship with Lorna LeBlanc, GP Minor Hockey Executive Director. Marj, Darren’s mother wants it known,“We depend on thousands of dollars of revenue from this source to keep our rink and programs going. All of our rinks were community efforts”. How many hamlets with a population of 500 can rally to construct and maintain a hockey arena? Grovedale’s community spirit has deep roots extending to the homestead era of the 1930s when Darren’s grandfather moved into the area. Even though one’s nearest neighbour may have lived on the next quarter section they knew each other, cared about and if need be cared for one another. Co-operating and working together to make the community functional was a necessity but also a pleasure that enabled neighbours to get together and socialize. This giving attribute is still evident in Darren’s generation and was reflected in Darren’s unselfish performance as a team-first player. One cannot aspire to become an elite hockey player without superior skating skills. With reference to his skating ability, Darren was often compared to players such as Scott Neidermayer and Paul Coffey. Darren attributes his grace and strength as a skater to the amount of ice time that was made possible for him and his Grovedale friends thanks to the support of his family and other volunteers. There is little doubt that Darren and his friends were more comfortable on skates than in their overshoes. Another interesting feature about Grovedale hockey is that their informal scrimmages included young and old alike. “It didn’t matter how old you were back then. Kids of all ages gathered … from five to sixteen - we were all out there,” recalls Rocky. This was another indication of Grovedale’s community spirit: the locals worked together and they played together. 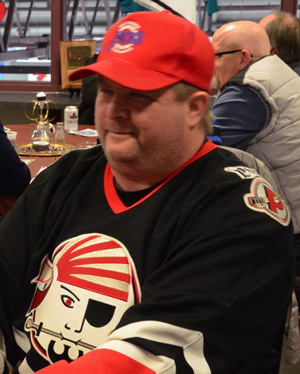 Not mentioned by anyone were the number of times a player broke through a muskrat run or shell ice at the edge of the pond – it must have happened. No one spoke of the frozen body parts and the bitter sting from returning circulation, of the gallons of hot chocolate consumed to fuel the young hockey machines and the numerous cords of wood that provided a bit of light at night and kept at least one side of a body warm. Grovedale had all of this – all of the romance associated with Norman Rockwell paintings on the cover of a Saturday Evening Post. Reminiscing, with a hint of nostalgia Scott reflects on “How good we had it in Grovedale. We would get handed the keys to the arena and told to shut off the lights when we were done.” According to Scott, Darren was not only a good all around athlete; he excelled scholastically and was a popular kid but not one to speak of his abilities and achievements. It is worth mentioning that Stan Neufeld was a teacher at the Grande Prairie Composite High school while Darren was a student there and confirms Scott Seymour’s report that Darren was a well balanced, disciplined, serious and superior student – an all around great guy. Marj McAusland reports that, “Darren was very quiet. After coming from a game we would ask Darren how it went and he would say ‘Okay’. On the other hand Rocky would come home and brag about his older brother’s accomplishments.” Modesty was a hallmark of Darren’s character throughout his hockey career. How much does an adult remember about life at age three? Darren thinks he recalls having scored his first goal at that age in organized minor hockey. He was playing for the Spirit River Rangers under coach Dennis McAusland, his uncle, who farmed in that area. His teammates were as much as ten years his senior. Spirit River is approximately 95 km north of Grovedale. His grandfather, Bill McAusland was his principal chauffeur. Bill had moved to Grovedale in the 1930s where he filed for a homestead. The Wapiti River flowed between Grovedale and Grande Prairie: a major barrier that was crossed on an ice bridge during the winter. Boreal forest, home to an abundance of wild game, separated Grovedale from the mountains surrounding Jasper, approximately 300 km south. In 1934 Grovedale settlers and a sawmill owner constructed a current driven cable ferry and a shack for the ferry operator. During spring break up or when high water or driftwood made crossings unsafe a basket attached to the ferry cables was the only means of transporting goods or individuals across the river. The ferryman lived on donations of food from ferry users. A bridge crossing the river was constructed in 1958, a life changing event for Grovedale homesteaders and others south of the river. In addition to the wildlife, there were several First Nations settlements that hunted and trapped for a living and small-scale logging was carried on. In the spring trappers sold their catch to the Hudson Bay Fur trading post in Grande Prairie. It was in this wilderness context that Darrel, Darren’s father grew up: ancient history for Darren but recent history for Darren’s parents and grandfather. Farming during the post depression era was far from easy, especially, said Darren’s father Darrel when “we were forced to sell calves at a loss for sixteen cents per pound.” From a financial perspective times were tough according to Uncle Doug, “but our family made the most of our circumstances.” With the bridge in place the hinterland opened to large-scale logging, oil field exploration, camping, fishing, hunting and other recreational activities in the once inaccessible Two Lakes and Kakwa Falls areas.